The past few days have been so hot that we’ve been waking up early to get the chores done before it’s miserable. We’re in for a cool down next week but it’s really nice to be up early working while it’s still quiet and still. The peppers and ‘maters are loving the heat! This past February/March we were able to get a greenhouse up! Unfortunately due to the cool first part of spring (snow on May 2! ), the seeds didn’t germinate as quickly nor did the plants grow as fast as I would have liked but I’m pleased to have started nearly everything we’ll be growing this year. We’re nearly done getting everything in, melons are still waiting on some panels as we plan to grow them vertically and now that the pigs are moved to pasture, their old pen will be put into a “goat/pig garden”. I made trellises from broken tree limbs for the pole beans pretty simple with a miter saw and some drywall screws. We also planted a few rows of corn with pole beans beans (space saving!) but we’ve not had very good luck with corn in Kansas so far (planted in a location that gets too much water), so I wanted an alternate location for the beans in case the corn fails again. We’ve also put the corn up in the far SW corner that is on a hill and I can cut off water to this location so they do not get too much. The other plants are a bit more tolerant of too much water and not that we’ve had wet years, Lordy knows, but we do water with a sprinkler. This year I’ve started watering by hand to keep the weeds down in walkways, we’ll see how long that lasts =). The cow peas and Lincoln peas are out of the ground! We took old posts out of the ground when we replaced our fencing a couple of years ago. I re-purposed them to make planter boxes for herbs, lettuces and such. 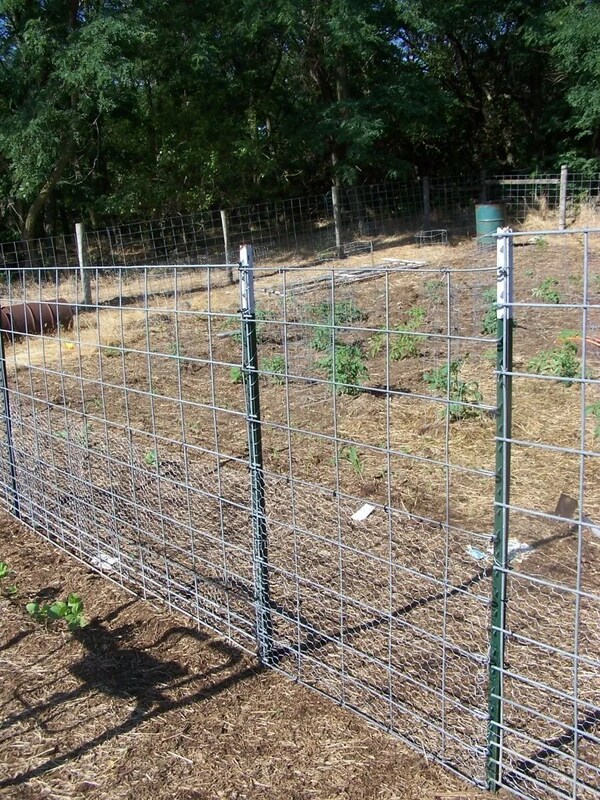 We keep the free range chickens out of the garden with chicken wire along the bottom of the cattle panels. This also has proven to keep out rabbits, racoons, etc. Green beans (garden) & bacon (soon to be farm raised), cukes (garden) and BLT’s (lettuce and tomatoes from the garden). YUM!!! Lemon cucumbers. They don’t taste like lemons, but when ripe, they sort of look like them! Heirloom, organic and non-GMO! Well, it wasn’t the heat zapping my squash plants…or perhaps not entirely. It was squash bugs. I let them have them. I didn’t have the time to save them. 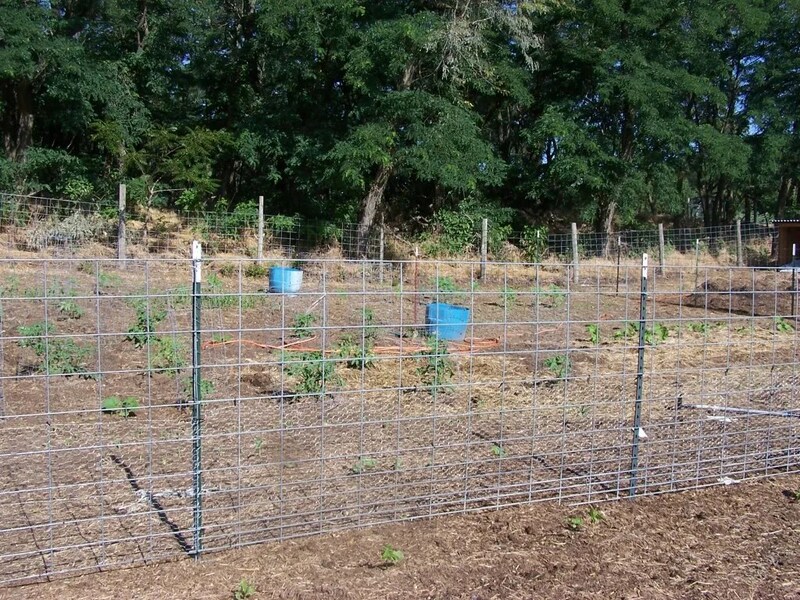 It’s unfortunate but live and learn…I want to keep it organic, I fenced the chickens out, I don’t have neem or diatomaceous earth at the moment and so, bye bye squash plants! The good news is is that I have finally pulled 2 ripe tomatoes. I was selfish, I ate them, secretly…behind the corn…in the middle of the day…while no one was watching. Shhhh, don’t tell anyone. The vines are LOADED and soon enough there will be plenty to share, we just need to wait a while longer. The cuke and melon plants are loaded with blooms and I can see tiny little melons forming. I know most others are harvesting a plethora already whilst we have to be patient. But, it will pay off! It is hard to know how much the garden changes just in a few short days when you are used to seeing it every single day. 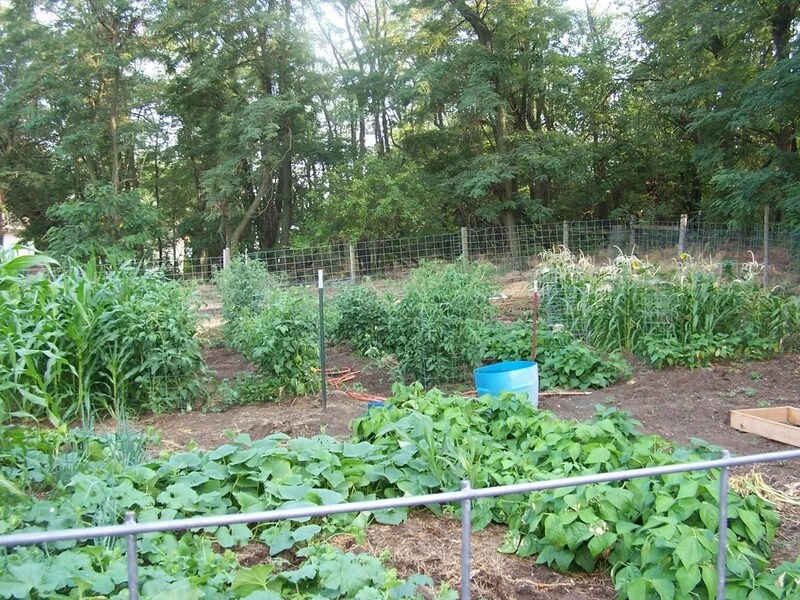 Jeremiah spent 5 days in Kansas City recently, when he came home he mentioned how much the garden had grown! It does seem to be growing leaps and bounds in this heat but we’ve lost several squash plants despite the extra watering they are getting. It’s just too much for them. We’ll move their location next year so they get shade sooner. Course, the heat the past 2 years seems to be out of the ordinary . Just the same, live and learn. Meanwhile, everything else is LOVING the temps…and the water too, of course! The garden is growing up so nicely! The tomatoes have fruit on them, the peppers & chiles are finally growing well and have little fruit on them and the melons and cukes I had to replant because of the chickens are vine-ing out! My potatoes are up, onions have grown well since day one and the corn, while having to deal with the winds that come along with these storms, is fairing well. I think the beans are growing the quickest with several varieties already being 6 inches tall and planted only a week ago! This rain sure has done it all well! I realize it’s been a while since I’ve written about the garden. Truth be told it was on the back burner a bit. I didn’t get the garden in as soon as everyone else did. We had such an early spring that so many planted early and are already getting tomatoes and squash, broccoli, etc. out of their garden(s). We also had the chickens eating or scratching up quite a bit of the corn and melon plants. Just last weekend we finished putting up fencing and so far, we’ve not seen ANY chickens in the garden, thank heavens. Some of the tomato plants were chomped off by bugs. I know a lot of people put cans or buckets around their plants to keep them from being eaten. I didn’t. However, the 3 tomato plants that were toppled, I replanted at the urging of a friend of mine and sure enough they rooted and are vigorous! A bit smaller albeit, but doing really well nonetheless. This morning I noticed one small tomato on one of the plants. Soon enough we’ll be eatin’ from the back yard again! The ancho pepper plants are FINALLY starting to poke their heads out! I don’t have many, 2 I think at last count and one may have had the top eaten off. 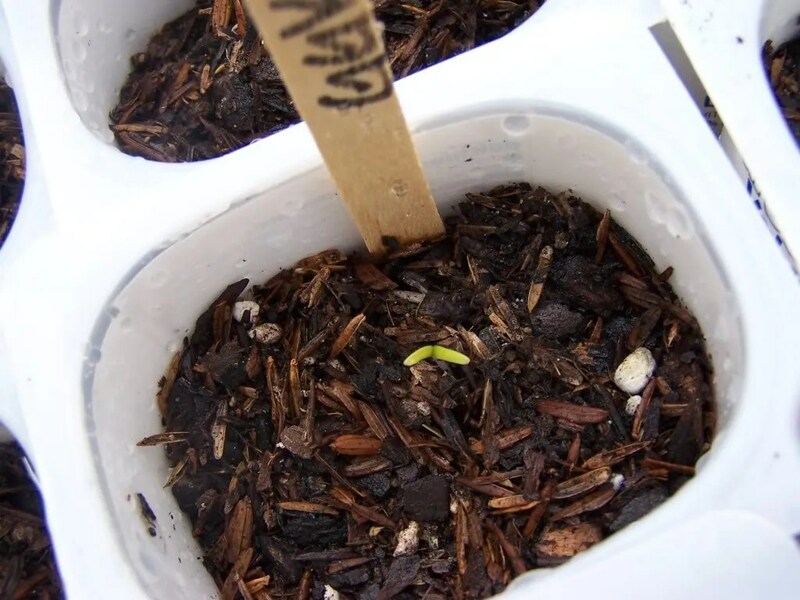 Those pepper plants took SO long to germinate. It was probably not near warm enough for them in the cold frames. The tomatoes however, are flourishing! In fact, I need to transplant those suckers into bigger pots this weekend before they get root bound. My Mom in Ca. 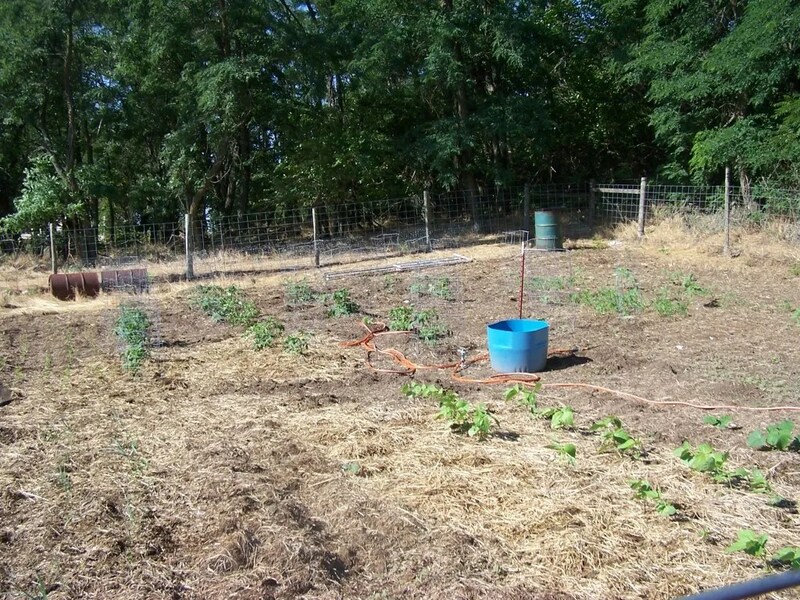 also sent me some seeds from Peaceful Valley – melons, some paste tomatoes, squash, and several other things. I’ll get those in to some pots this week. I really didn’t expect to see my seedlings emerge, they’ve literally just been outside day and night but with the warm temps. we’ve had, it’s no wonder! And, it’s sad to say, these poor seeds are 3 years old and were not at all stored as they should have been. The poor dears were stored in a un-insulated shop over 2 winters and 2 hot summers with temps ranging from -24 to 110+ F, resilient little buggers they are, apparently! I didn’t even know I had them until about a week before I planted them but sure enough, they’re still alive! We’re making up some cold frames today however, and they will be warm this evening when the temps are expected to dip in to the 40’s. If nothing else, I’ll get a florescent light on them. We’ve yet to get anything else in to the ground. I’d like to get carrots, cauliflower, brussel sprouts, broccoli and cabbage. I keep forgetting to send in the plastic barrels we have with Jeremiah so that he can cut them in half to make potato pots out of. I have TONS of great compost to fill them with that has been sitting for a year + that came out of the barn. We’re so enjoying this spring weather!